When seen in cross-section, channels (red arrow) have elliptical profiles and are filled with sediment that is generally coarser than the surrounding rock. They also cut into (by erosion) the underlying rock. 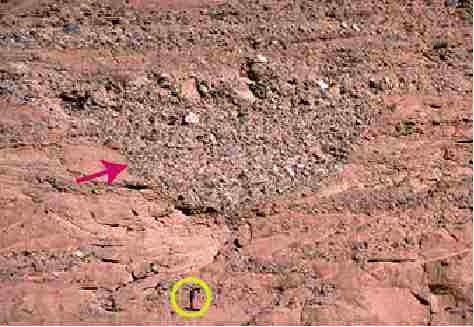 Hammer (circled) shows scale. Channel deposits indicate running water: they form on alluvial fans, in rivers, on deltas, even in submarine fans. Both of these photos are of channels in alluvial fan deposits (note how coarse the rock is). The red dashed line on the right shows the channel. the orange lines show bedding beneath the channel. Notice how it is cut by the channel.